Apple’s latest iPhone might be red, but it’s not Red in China. The special-edition version of the iPhone 7 and 7plus goes on sale in more than 40 countries, but China has done it slightly differently. The BBC explains why. Red is a charity looking to combat Aids and was originally founded by U2 musician Bono and activist Bobby Shriver. It gives the money it raises to the Global Fund for HIV/Aids that doles out grants. This includes providing testing and treatment for patients with the aim of wiping out transmission of HIV. Apple is the world’s largest corporate donor to the Global Fund. The special-edition devices celebrate Apple’s long-running partnership with Red and a portion of the sales will go towards its relief operations in Africa. But Apple’s Chinese-language sites don’t mention the product or cause. This left some perplexed. Internet users were among the first to spot that there was different branding on Apple’s landing page depending on the Chinese territory. 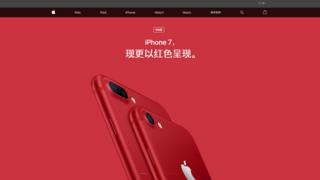 When translated from Mandarin, Apple’s China retail website for the Red devices simply read as “now in red” while the Taiwanese site used the words “product” Red which the US and other countries have as well. Some analysts read this as yet another example of Chinese politics interfering with Western brands looking to do business in the world’s most populous nation. Apple had no comment on the matter. One possibility is that Apple is looking to navigate sensitivities in a state where messages are controlled: HIV/Aids and homosexuality remain taboo topics in China. The first case of HIV in China was recorded in 1989. By 2000 the disease was found in most of China, and as it continued to spread, the government kept denying the problem. Today discrimination against Aids patients is common. Well there’s the Dalai Lama. Earlier this year Red’s Instagram page showed a picture of the Tibetan spiritual leader, whom China considers a dangerous separatist. This has led some to point to how the post was trolled. How will Red do in China? Apple has faced numerous challenges in China of late, which may be one of the reasons why it is offering the Red iPhones as a colour option as opposed to a product. Last year Apple’s online film and book services were shut down in China. Apple was also made to pull the New York Times from the China App store following a request from the authorities. But the red iPhones are poised to sell well because the colour is considered to be the most auspicious in Chinese culture and it is considered a prestige product there. The tech behemoth is clearly trying to maintain relations with its fastest-growing sales region. Apple chief executive Tim Cook has been making semi-regular trips to China and is opening four research and development centres later this year.